We’re reluctant to say too much about this mind-blowing blockbuster...there’s not a lot to go around and it is sought after by the savviest collectors every year. Chateau de la Negly is located 20 km from Narbonne in the heart of the massif de la Clape. It is run by Jean-Paul Rosset who with winemaker Cyril Chamontin and consultant, Claude Gros, have made vast improvements in recent years and have received much critical acclaim for their impressive and complex wines, so much so that they could probably be called “cult status” at this point! This wine is NOT for the shy. Just read the huge-scoring reviews to get a sense of the scale here. And most importantly...MOVE FAST! If you need a few wines to fill out your 6-pack (for free shipping), or, if we’ve sold out...CLICK HERE to browse other Syrah based/Rhone wines! Good luck! The Chateau de la Negly is located in the Languedoc, overlooking the Mediterranean, in the exceptional terroir of La Clape. They original Negly vineyard spanned 123 acres on clay limestone soils which gives Negly its signature palate impact and broad shoulders. In 2006 they acquired the neighboring 62 acres on alluvial sand and sandstone soils which was replanted and now is farmed sustainably and by hand. Consultant Claude Gros has further refined the work in the cellar it's not a mystery why La Negly is the top of the class in Southern France. 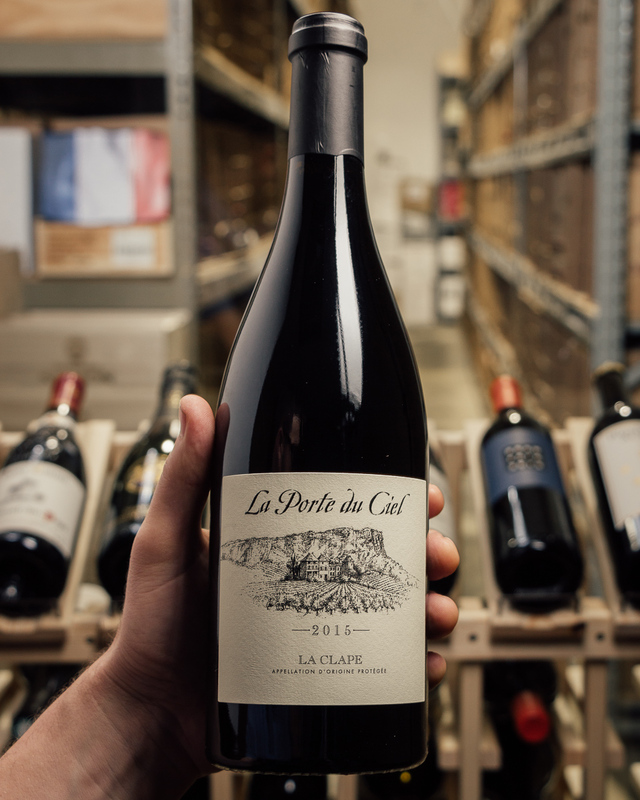 The 2015 La Clape Porte du Ciel (100% Syrah) is scheduled to be bottled in two months, and it's another awesome vintage for this cuvee that's up with the top 2-3 vintages ever produced. Possessing a huge nose of currants, white truffles, game, olives, and bacon fat, this beauty hits the palate with full-bodied richness, a deep, layered, multidimensional texture, sweet tannin, and awesome length. Like the 2016, it stays light and elegant, and is another singular, world-class wine from this remarkable estate. Scheduled to be bottled next year, the 2015 Clape la Porte du Ciel is another tour de force from this team that’s unquestionably one of the wines of the vintage. More clean, straight and fruit driven than previous vintages, without the standard Porte du Ciel wildness (which I suspect will develop with bottle age), its deep, saturated purple color is followed by awesome notes of cassis, licorice, violets and hints of olive tapenade. With ultra-fine tannin, no hard edges and full-bodied richness, it should shine with 2-3 years of bottle age and keep for a decade.